Back in the 1980s, no right-minded child wanted to be Han or Chewie. If you were smart, you wanted to be the expendable Stormtrooper. 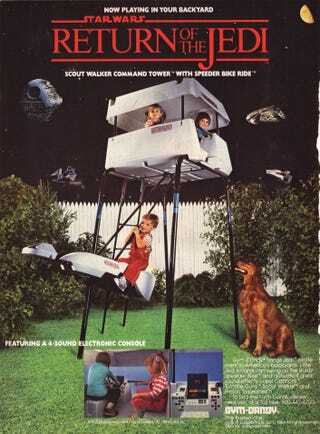 Then you could commandeer this insane Imperial walker play fort and lord over your peon friends. 1.) The surreal collage of all the Star Wars vehicles against the white picket fence. 2.) The happy dog, silently saluting Sith hegemony with his tongue. 3.) The kid on the speeder bike swing, holding on for dear life in the absence of adult supervision. 4.) Evidence of a gender-neutral Stormtrooper regiment. There was also this 1983 speeder bike pedal cart, but you had to be an extra well-behaved Imperial drone to receive one of these. Only 200-300 were produced as promotional items.